inertial resistance to rotation and the force required to overcome this resistance to rapid angular acceleration may be greater than the shear strength of the rotating band. If this is the case, the surface of the band may be stripped off completely before the projectile has acquired any considerable spin velocity and the flight of the projectile after it leaves the muzzle will therefore be unstable. A condition of this sort is certain to make the gun hopelessly inaccurate. Some improvement of this condition may be possible with the use of progressive twist rifling, particularly if the rifling starts at zero twist and increases gradually to full twist. Rifling of this type would tend to accelerate the spin of the projectile more smoothly so that there would be a much better chance of not stripping the rotating band. However, if the projectile is moving too rapidly when it engages even this type of rifling, the rotating band may still be stripped. Although the acceleration would be smooth, it would have to be quite high and it is possible that the rotating band could not stand the required force. Another solution to this problem would be to employ the combination type of action in which the round is moved forward so that the projectile enters the barrel before firing. 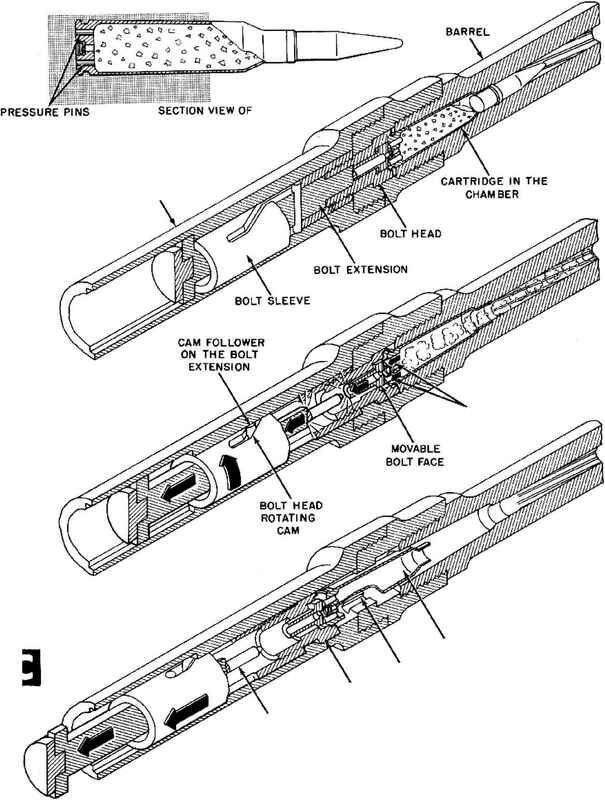 If this is done, there will be no free travel of the projectile and the rifling will function in the normal manner with no danger of stripping the rotating band.